Despite their size (1/8" to 3/8" long), fire ants are dangerous pests. Americans spend approximately $6 billion annually on control measures, medical treatments, and damages related to fire ants according to the U.S. Department of Agriculture’s Agricultural Research Service (ARS). The red imported fire ants are known for living in large populations throughout the southeastern United States. Depending on whether colonies have one or multiple queens, they can contain hundreds of thousands to millions of ants. While fire ants enjoy warm weather, homeowners should know that extreme conditions send them indoors seeking shelter, food, and more favorable conditions. Common sites for indoor infestations include wall voids, bath traps, and shower stalls. Great information on FIRE ANTS! These reddish-brown insects, named for their fiery stings, are territorial pests that send out alarm pheromones, or signals, climb out of mounds and sting to defend their homes. Fire ant stings typically cause small blisters or pustules to form at the site of each sting. Blisters itch and burn while healing and are prone to infection if irritated. While fire ants are omnivorous and regularly kill insects, ground-nesting birds, and other wildlife, they are also attracted to oily, greasy foods and pet food in and around the home. 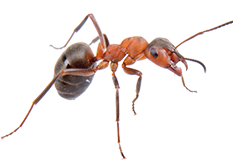 BLUE STAR has a Fire Ant protection program that we guarantee for 90 days. Our Fire Ant service eliminates all fire ants from the treated area, not by baiting the Queen, like most of your over the counter products, but by eliminating all the Fire Ant foragers, thereby starving the colony and creating total elimination. Most of our Fire Ant customers treat their yards twice a year, and are extremely happy with the results, as their kids and grand kids can play in the yard again without the fear of fire ant bites. This service starts at $45 per treatment depending on the size of the area to be treated.